Today we're proud to announce the availability in beta of RabbitMQ add-on by VMWare. 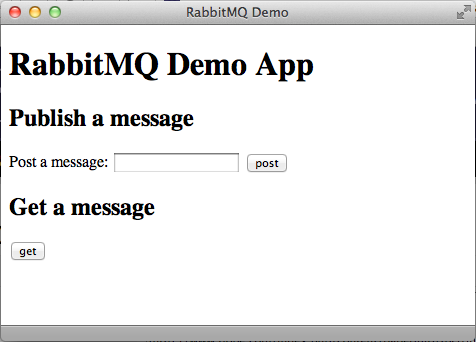 RabbitMQ is an open source implementation of the AMQP protocol that provides a robust, scalable and easy-to-use messaging system built for the needs of cloud application developers. Note that in RabbitMQ a message is never sent directly to a queue. Instead, it passes through an exchange, the type of which defines how messages are distributed to one or more client queues. In this case, we're side-stepping the concept of exchanges by using the default nameless exchange, which allows us to specify the target queue for our messages using a routing key. Once you get into more advanced usage of RabbitMQ such a broadcasting messages to set of known queues, you'll definitely want to learn more about exchanges. self.class.rabbitmq_exchange.publish params["message"], :key => "messages"
@notice = "Message has been published." @notice = "No more messages." The first interesting part here is post to "/" where we send the message you typed in to the default exchange, using "messages" as the routing key. Then we pick up any outstanding at "/messages" by popping off the queue, which follows the FIFO principle. The rest, as they say, is just a bit of HTML. Why would you want to use a messaging system? The distribution of workloads across different process types is an essential aspect of modern web application architecture. For example, if your app handles file uploads, your web process might receive the upload and signal a background worker to do some processing on it via a queue. While you could use Delayed Job or another database-backed queueing library to do this, a true messaging system gives you much more flexibility, reliability and scalability in defining how your signals are distributed and received by your worker pool. Finally, messaging is an important tool for the polyglot programmer. Having a language agnostic, data-centric message bus that can orchestrate communications between, say, a web app in Ruby, workers in Java and a chat server in Node.js is a key enabler in allowing application developers choose the right tool for any specific job. Over the past few years RabbitMQ has emerged as one of the most popular, open source choices for messaging with clients in all major languages, and thousands of enterprises trusting it for mission-critical apps. We're excited to offer it as a cloud service through the Add-ons Catalog, fully managed and operated by the team who created it.